St Jarlaths Credit Union are generously donating €1,000 to Tuam Cancer Care, when they get 1000 new LIKES to their Facebook page. Please click on the link to St Jarlaths Credit Union Facebook page below and get LIKING to show your support for us. 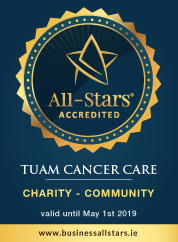 Please support Tuam Cancer Care and help us provide support in the local community. Click here to for ways to give. To donate €4 simply text TCC to 50300.